With about a third of all bikes we sell going out with dynamo lighting, Joe Bike is Portland's best bike shop for dynamo hubs and lights, dynamo-powered phone chargers, and complete systems. We carry Schmidt, Shutter Precision, and Shimano dynamo hubs; smart-device chargers from Busch & Mueller, Supernova, and Sinewave Cycles; and dynamo lights from Busch & Mueller, Supernova, and Schmidt. For off-road, deep wood illumination, we carry both K-Lite and Exposure bikepacking lights. Dynamo lights are battery-free bike lights that use the energy generated by the rotation of the front wheel's generator hub. Other names for these lights include bike dynamo, bicycle dynamo, or even dynamo bike light. Like disc brakes or, say, Gates Carbon Drive (belt drive), dynamo lighting is one of those things you just have to experience in order to appreciate. You do get to charge your smart phone, Garmin, or other GPS device simply by riding your bike (see The Plug III, the Busch & Muller Luxos U, and the AXA Luxx70 Plus). You will not be able to satisfactorily charge larger smart devices such as iPad. While it costs more up front, in the long run you save money. Right now we're recommending Busch & Mueller Toplight Line Plus with Brake Tec ($55; that's the one with the brake light) for the rear dynamo light and the 100 lux Busch & Mueller IQ-X ($146) for a dynamo headlight. 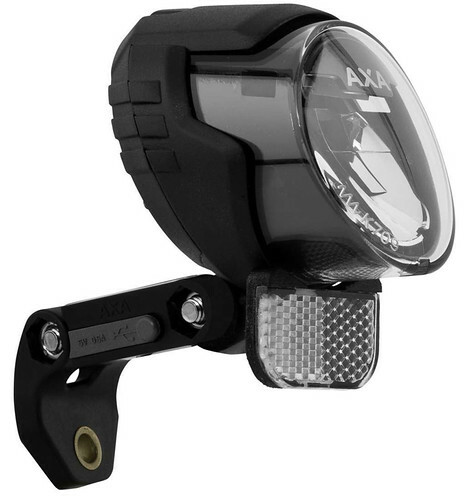 Or, if you want to charge your phone or a battery pack, the Busch & Mueller Luxos U headlight ($258), which features a USB charger, a handlebar-mounted switch, wider light dispersion, and a super bright 70 lux (along with the ability to beam 90 lux for short periods). All of the dynamo lights we sell have a standing light so it stays on while you're stopped at a red light. If you're commuting in the city and don't need the overachieving power of the Luxos, you might consider the new Busch & Mueller Lumotec Eyc T Senso Plus. For $80, this diminutive (we’d even say cute) but powerful headlamp is an excellent choice for city commuters who usually ride slower than 17 or 18 mph and who want to be seen without necessarily needing to light their own way. The version of Eyc (rhymes with “Ike”) that we carry features a daytime running light and a senso that boosts light output when it gets dark. (Or you can choose to turn the daytime running light off.) It also has a standing light, meaning it remains on (for 4 minutes) while you’re stopped. For the rear light, the vast majority of our Portlandistan customers choose the rack-mounted B&M Top Light Line Plus with Brake Tec, $55. It pulses and it has a virtual brake light that's activated by sudden deceleration. This was our most popular Shimano dynamo hub through 2013. 6v, 3.0 watt output. Works ideally with your touring or commuting bike. It can also power most smart devices via a handlebar-mounted USB port, in conjunction with a Busch & Mueller Luxos U or AXA Luxx70+ front light. But we have a better idea: for $50 more, you can get a superior Shutter Precision PD-8 or PL-8. Those are now far and away our preferred hubs. Shimano Alfine S701 dynamo hub: $125 hub only, or $230 built into your existing rim The Alfine S701 is one of the first 1.5 watt (6 volt) hub dynamos with German StVZO approval for LED lamps. It combines filigree appearance, light weight (only 433g, vs. 575g for the S501), and extremely smooth rotation. Powers many front and rear lights easily--except for the newer very powerful lights, such as B&M Luxos. When this hub is used, your big powerful lights won't put out normally. Also, if you plan on charging a smart phone (such as with the Tout Terrain The Plug III or the Luxos U light), do not use this hub; get a normal 3-watt hub instead, like the Shutter Precision, for $25 more. The Shutter Precision hub is lighter, too. Shutter Precision PD-8 Price: $150 hub alone; $255 built into your existing rim. This is now what we believe to be the best dynamo hub and is by far our most popular dynamo hub, going into about 90% of our dynamo wheel builds. SP dynamo's hubs are not only the lightest, but also the most efficient 3w hub on the market, and are virtually identical to the BioLogic Joule 3. The lightest SP dynamo weighs in at an unprecedented 360-390g (lighter than the little Shimano S701 1.5w!) while attaining an unmatched efficiency of 72%. These 3w dynamo hubs are premium products designed and engineered for the most demanding cycle tourists, commuters and enthusiasts. Although various colors are occasionally available, usually we can get them only in silver or black. It should be noted that the bigger your wheel is, the faster you'll need to be going to get your dyno hub to produce power. And this is where the Schmidt SON28 hub beats the Shutter Precision; it supplies lights and The Plug III with power at lower speeds than does the SP. This may not matter if you're on 26" wheels, but if you're riding a 29er and will be riding long stretches at under, say, 15 mph, just go for the Schmidt OR go for the American-made Sinewave Cycles Reactor, which outperforms The Plug III and lets you charge your smart device while simultaneously power your lights. This is traditionally the world's most highly regarded dynamo hub. Its very similar in performance to the Shutter Precision hubs. The Plug III gives improved performance over the II at both low and high speeds, and costs a few dollars less ($189). Want to charge your iPhone or other smart device even if you don't have a Luxos U or AXA light? Tout Terrain's The Plug III ($189) is one of the best converters on the market, second only to the Sinewave Cycles Reactor. For use only with 3w dynamo hubs. Doesn't work sufficiently well with 1.5 w hubs. One advantage The Plus has over the Luxos U and AXA lights is that it's probably less likely to be stolen. This is a nifty and highly efficient USB charging port that channels current from any standard 3w dynamo hub to charge smart devices such as phones, Garmins, and other GPS devices. It can also be used to recharge USB-rechargeable batteries for your lights or other devices. Not designed to charge iPads or other large smart devices directly. With a little wiring re-work that we can do, The Plug will function even while your dynamo is also powering front and rear lights, although you will have to maintain a speed of around 15 mph for all of that to happen. Otherwise, this latest version of The Plug charges even at slow speeds, starting at about 6 mph. That's a nice benefit to bike tourers hauling heavy loads. Finally, it's pretty inconspicuous and is considered relatively theft-resistant. Sinewave Cycles' Reactor. Outperforms The Plug III. A challenger to The Plug is the American-made Sinewave Cycles Reactor ($220). Similar to The Plug but even less conspicuous (there's not a single letter, number, or graphic on it), the Reactor has two big advantages over The Plug III: first, it begins charging at under 4 mph, and second, it lets you charge a device even while the dynamo powers your lights. All the electronics are encased in resin, so the Reactor should be weatherproof and shock resistant. The S701 hub is notably smaller and lighter than the S501, but it produces only half the output: 1.5W instead of 3W. (All other dynamo hubs we carry produce 3W). This hub is intended for city use, it's not intended to power the super-bright Luxos lights or to charge smart devices. It will do both, but not as well. A great front light to run with this hub is the B&M Eyc or Eyc T(and any B&M tail light). Note that for $150, the Shutter Precision hubs are actually lighter and produce 3W. For use with centerlock rotors. This is now by far our most popular dynamo hub, going into about 90% of our dynamo wheel builds. SP dynamo’s hubs are not only the lightest but also the most efficient 3w hub on the market, and are virtually identical to the BioLogic Joule 3. The lightest SP dynamo weighs in at an unprecedented 360-390g (lighter than even the little Shimano S701 1.5w!) while attaining an unmatched efficiency of 72%. These 3w dynamo hubs are premium products designed and engineered for the most demanding cycle tourists, commuters, and enthusiasts. Their performance and reliability are on par with Schmidt. There's one exception: the Schmidt will start producing light at around 7 mph, whereas the Shutter Precision at around 11. The bigger your wheels are, the higher those minimum speeds, and the converse is also true. Although various colors are occasionally available, usually we can get them only in silver or black. This is traditionally the world’s most highly regarded dynamo hub. It's very similar in performance to the Shutter Precision hubs. •Available with ISO 6 Bolt Disc or Centerlock Disc configuration •6V / 3W •Hub Shell: aluminium 6082 T6 •Axle: hollow axle Ø 10 mm, strain-hardened stainless steel •Bearings: deep groove ball bearing 629 2RSH •Magnets: neodym iron boron, 26 poles •Weight: 460g. (6 Bolt); 430g. (Centerlock) •5 year warranty (longer than any other hub) The Schmidt SON28 is especially recommended if you want light at especially low speeds. It will produce front and rear light starting at about 7 mph, whereas the Shutter Precision will start at about 11 mph. And that's the Schmidt's one distinct performance advantage over the SP, to our knowledge. And remember that the bigger your wheels and tires are, the faster you'll need to be going to make light happen, so if you're riding a 29er under 12-13 mph for long periods, the Schmidt may be best for you. New from Busch & Mueller, the IQ-XS is smaller and lighter than the IQ-X but costs a third less while packing almost the same punch. The extensive light field, as well as light at close range, makes every ride in the dark an enjoyable experience. During the day, the integrated daytime running light offers maximum safety. Includes wiring for a taillight. A solid choice for a relatively low-cost, reliable dynamo. Works well with your touring or commuting bike. It can also power many smart devices and GPS units via a handlebar-mounted USB port, in conjunction with either a Busch & Mueller Luxos U front light, Supernova's The Plug power converter, or the Sinewave Cycles Reactor power converter. Quick-release axle for standard 100mm-OL dropouts. For bikes with centerLock disc brakes (can also be used with rim brakes). The E3 TL2 tail light is intended for use only with Supernova front lights. The seatpost version attaches to your seatpost by an o-ring and includes a pair of gold-plated connectors. E3 Triple features a wide illumination pattern for outstanding illumination off road. Not recommended for on-road use, as the light can blind oncoming traffic. Aluminum case, 130g Wiring included. Powered by standard dynamos (dynamo hub not included) Ideal for 24-hour MTB racing, off-road bikepacking, randonneuring, cyclocross training, and general off-road night riding Choose either the Multi-mount version, which is a versatile dual-pivot, height-adjustable arm that mounts to hole in fork crown, or the handlebar mount version. If you are using a suspension fork, get the handlebar mount. Internal capacitor keeps the light on for up to 7 minutes after you stop pedaling. What tail light to get? Just make sure it's the same brand, as Supernovas don't always play nice with others.